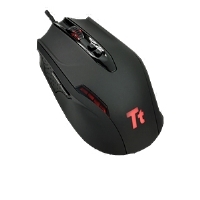 New from the Thermaltake eSPORTS line is the Thermaltake Tt eSPORTS Professional Black Gaming Mouse and it is a mouse made for the professional gamer in mind. It features a ergonomic right-handed form factor with no slip contoured grips. One of its 6 buttons is a easy shift thumb button for previous page for Internet Explorer use, right out of the box, no software needed. Some highlights in its form factor is a gold-plated USB connector to avoid lag while playing, a braided cable to avoid tangles, Teflon feet to avoid slow speed maneuverability, and a unique pulse lighting system to avoid looking generic. The Thermaltake Tt eSPORTS Professional Black Gaming Mouse uses a 4000 DPI twin-eye Laser engine, which you can easily switch between the 4 levels of DPI settings without installing software. Simply use the 2 DPI switches located below the scroll button to toggle between 400, 800, 2000, and the 4000 max, while looking at the DPI indicator on the mouse. If customizing the DPI isn't enough you can also adjust the mouse weight on this Thermaltake Tt eSPORTS Professional Black Gaming Mouse for perfect mouse control handing. All you have to do is flip the mouse over to reveal a weight compartment which holds 5 (4.5g) weights that you can add or remove to make a perfect balance for your specific gaming needs.